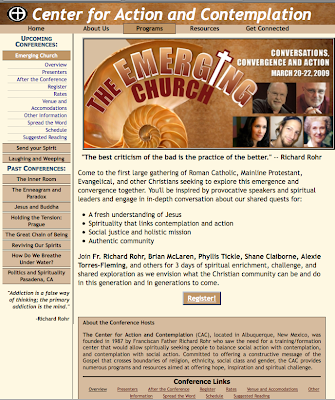 Well, here's a Catholic version of the "Emerging Church" which appears from the tone of the brochure to be networked with the Protestant comrades in apostasy. This is exactly the type of material I was viewing back in 1981 when I first discovered the New Age Movement. The apostates were an ecumenical bunch then and they still are now -- with the benefit of broadband internet this time. Many, many thanks to Carrie Tomko for posting this information and the link to this brochure on her blogspot. Here is a link to Carrie's site. I recommend you visit it from time to time. 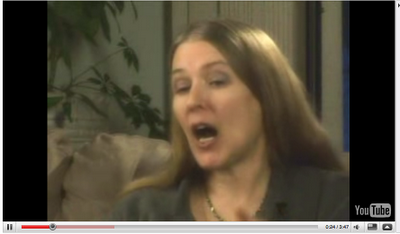 Carrie writes from a Catholic perspective and has kept amazing pace with New Age threats with that religion. I am praying that the incessant squabbling on my forum / comment section will soon cease. Blessed are the peacemakers! London Financial Times admits "global governance" = "world governent" -- dictatorial at that! I'm not a regular reader of "Prison Planet" by Alex Jones because I am cautious at his approach; however, I do respect the work of Old Thinker News to which I have a link. I am afraid I missed this one, but it should not be overlooked in the rush of holiday news. The London Financial Times has been an important news site. They feature some of the best reporting on Javier Solana. According to a December 9th, 2008 Prison Planet article by Paul Joseph Watson, the London FINANCIAL TIMES has admitted that "global governance" equals "global government." As the London Financial Times has too often been a cheerleader for Javier Solana who in turn has been the biggest of cheerleaders for "global governance," I'm not sure what their angle is: to make us think it is inevitable or because they finally woke up as sensible Britons and smelled the coffee. You can read that article by clicking here. The article itself has links you can access to the original FT story. Stay tuned! "Dec. 8 (Bloomberg) -- European Union foreign-policy chief Javier Solana called for increased international pressure to be placed on Robert Mugabe to stand down as president of Zimbabwe, adding to calls for change amid a growing humanitarian crisis. "Solana adds his voice to mounting international condemnation of the Mugabe regime that has ruled Zimbabwe since 1980. Zimbabwe is suffering a cholera outbreak that has killed almost 500 people after the collapse of the health and sanitation systems following a decade of recession and political upheaval. The Health Ministry reported 484 deaths and 11,735 cholera cases since August, according the Web site of the World Health Organization. "The southern African nation meanwhile faces political stalemate following the failure to agree a power-sharing government in talks brokered by former South African President Thabo Mbeki. "Kofi Annan, the former secretary general of the United Nations, said yesterday that African leaders must raise pressure on Mugabe to speed up the power-sharing deal . . . The Elders, created in 2007 by former South African President Nelson Mandelato promote humanitarian causes, met Zimbabwean political leaders, donors and SADC leaders last month to discuss the worsening humanitarian crisis. "Solana said it is possible the EU will put more Mugabe associates on a list of those subject to a freeze on assets and travel ban." Today, Javier Solana appears to have his diplomatic hands full with the Israeli / Hammas / Palestinian Gaza crisis. Will there be recommendations for freeze on assets and travel bans there? It appears Solana's power and influence over that region are clearly growing, particularly in view of his new anti-piracy operations. TONIGHT MAY WELL BE THE MOST IMPORTANT SHOW I HAVE EVER DONE! I just hung up from talking with NIKI RAAPANA, tonight's guest, only 53 minutes from now on MY PERSPECTIVE. I am convinced that Niki, an Alaskan, and I have been long looking at two sides of the same elephant. She has CRITICAL pieces of the puzzle which has a political name of "Communitarianism." One of their big games is IMPLEMENTING Agenda 21 of "sustainable development." They are so very far along, as Joan Veon told us Tuesday. I don't know how I missed Niki's work before, but I am glad I found her. This show is CRITICAL! Chatroom participation would be very valuable to me tonight. It always is, but this night more than ever! Here is a link to her basic Youtube video. Good watching before we start! our nation, like Canada and all of Great Britian, is heading into rapid integration with the European Union. 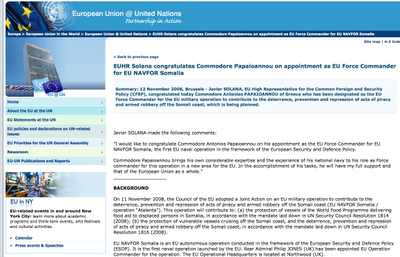 On November 15, 2008 the next president will co-host a meeting with EU leaders. Calling it a "financial necessity," the globalists are openly seeking global solutions. Whoever it is, our newly elected president will give their full support and executive clout to implementing the new global financial, economic, military and social justice system. The big lie is that Obama's "change" is any different from the GOP Doctrine. The neo-con right, the socialist left and the Third Way all agree on the principles for global sustainable development. I'm afraid what will happen if Americans cannot find a way out of this dialectical election madness. . . ."
Check it out and stay tuned! Sarah Leslie, the editor of CONSCIENCE MAGAZINE and HERESCOPE blogspot will be featured on MY PERSPECTIVE tonight. She has important information to deliver and she will have the hour to herself from 8 pm Eastern time, 7 p.m. Central Time, 6 p.m. Mountain Time, and 5:00 p.m. Eastern time to talk to our listeners. Sarah Leslie and I have worked together since the early 1990s. She is always timely and relevant and I urge you to join her both by listening live at www.themicroeffect.com and in the chatroom by clicking on the chatroom box at that site. Much is happening and Sarah is one of those helping us to stay tuned! Highly informed and respected financial / global governance expert Joan Veon is my highly anticipated guest on MY PERSPECTIVE internet radio program tonight, live at 5 p.m Paciific time, 6:00 p.m. Mountain Time, 7:00 p.m. Central time and 8:00 p.m. Eastern time. Joan says de facto, if not de jure, global government is coming -- it is here! Please join us both on the air and in the internet chatroom at http://www.themicroeffect.com/ tonight. 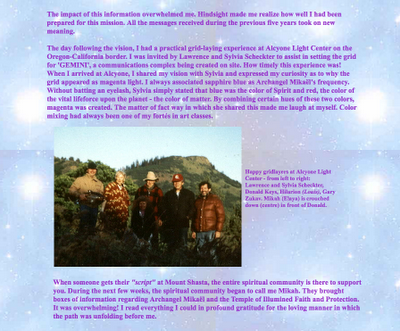 I also anticipate we will be discussing the new Benjamin Creme / "Maitreya" developments as in my December 13, 2008 article. Please join us and stay tuned! The Quartet for Peace in the Middle East is presenting a drafrt resolution allegedly drafted by Russia and the USA. The press release is 12 hours old as of this writing,2:40 a.m. December 14, 2008. Javier Solana repeatedly has said it imperative that the deal be in place by the end of 2008 or it would be more awkward in 2009. This coming as close as it is to the Maitreya press release about the "Christmas miracle," and considering the New Age plans of "World's End: 2009" as set forth in the Peter Lorie book which I would pay scant attention to, had it not been for the fact that it was published by Jeremy Tarcher and Penguin books -- major serious New Age publisher, particularly as to Tarcher. For the record, Javier Solana has been the only constant figure on the various configurations of "The Quartet" and its predecessor the Mitchell Commission. All the other players have come and gone -- he alone has been there through all of them. 1. Javier Solana's global governance by 2009 "imperative" quote. 2. Peter Lorie book covers. "There's something happening here -- what it is ain't exactly clear . . . ."
Betraya / oops "Maitreya's" Christmas 'gift' to us -- Just what we didn't need! 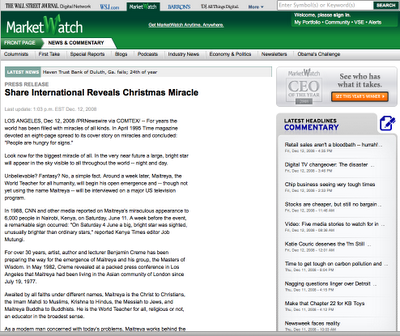 LOS ANGELES, Dec 12, 2008 /PRNewswire via COMTEX/ -- For years the world has been filled with miracles of all kinds. In April 1995 Time magazine devoted an eight-page spread to its cover story on miracles and concluded: "People are hungry for signs." In 1988, CNN and other media reported on Maitreya's miraculous appearance to 6,000 people in Nairobi, Kenya, on Saturday, June 11. A week before the event, a remarkable sign occurred: "On Saturday 4 June a big, bright star was sighted, unusually brighter than ordinary stars," reported Kenya Times editor Job Mutungi. For over 30 years, artist, author and lecturer Benjamin Creme has been preparing the way for the emergence of Maitreya and his group, the Masters of Wisdom. In May 1982, Creme revealed at a packed press conference in Los Angeles that Maitreya had been living in the Asian community of London since July 19, 1977. As a modern man concerned with today's problems, Maitreya works behind the scenes of our changing world. The outpouring of his extraordinary energy has been the stimulus for dramatic developments on many fronts: the ending of the cold war; the break-up of the Soviet Union; the reunification of Germany; the ending of apartheid in South Africa; the growing power of the people's voice, leading to demands for freedom and justice; and the worldwide focus on preserving the environment. Maitreya's message can be summarized as "share and save the world". He will seek to inspire humanity to see itself as one family, and to create world peace through sharing, economic justice and global cooperation. With Maitreya and his group working openly in the world, humanity is assured not only of survival but of the creation of a brilliant new civilization. Folks, this might be their move -- the one that was frustrated in 1982 - for real! Stay strong, stay in the Lord, and stay skeptical about Creme's / Betraya-Maitreya (whoever he turns out to be and you know my suspicions) probable "solution" to our economic problems. Could this be 'the hour of temptation to come upon all that dwell on the face of the Earth?" For the record: There is no Christ but Jesus. Once again, the pushers of the anti-christ are out and about, as when they ran those full page ads in 1982 proclaiming "The Christ is now here." Benjamin Creme did not come up with his London story until 5 days after a WRIF-Detroit radio debate he was not expecting with me was held. The newspaper ad campaign in 1982 cost upwards of $500,000.00. Nobody spends that type of money without very serious intent: but "Christ" and/or "Messiah", it clearly is not. Be very careful with this bunch. I personally witnessed a large Detroit audience of hundreds of relatively sophisticated and even wealthy people go under Benjamin Creme's spell when he was promoting this same "Christ" in 1981. Only upon witnessing that did I have any notion as to how Hitler had pulled off his bewitching of the German public: mass hypnosis! The real power in Europe, at least as presently structured is with the Council of Ministers of the European Union. Its Secretary General and the one who runs its affairs -- military and foreign policy is Javier Solana. The Commission serves only to MAKE RECOMMENDATIONS to the Council of Ministers. Ireland is said to have made a deal to get an Irish national on the Commission. 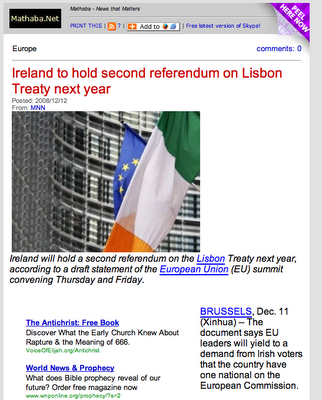 In exchange, Ireland is expected to ratify the Lisbon Treaty which it voted down earlier in 2008. It looks like the pressure will be on Ireland to ratify and it will be extremely interesting to see how this plays out -- especially given the additional military powers now obviously under Javier Solana's "remit", not to mention his global governance aspirations. Looks like the "good doctor" as Farmer puts it, is not going away anytime soon. Stay tuned! I have long been puzzled by the unavailability of Donald Keys, who admittedly would be an elderly man by now as I understand he was a WWII veteran. He was so extremely active with just about everything that was New Age/New World Order and then after 1985, he seemed to suddenly disappear. I had heard rumors that he, like Peter Caddy, had taken up residence on Mt. Shasta. Tonight I did a "googling" and found this picture. I would like Old Man of the Ski's comment on this. Beware of the New Age music when you go to the link! The whole Mt. Shasta thing is weird, even by New Age standards! 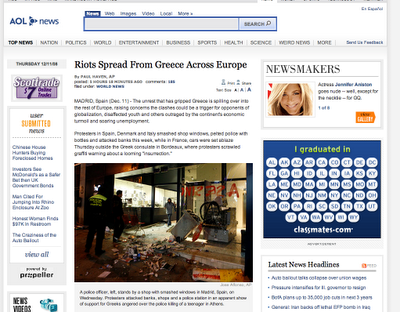 MASSIVE RIOTS CRIPPLE GREECE: EUROPE'S EMERGENCY? Greece, in presumed reaction to the "global financial emergency" is rioting. A 15 year old boy was killed by police in earlier demonstrations today. Now Yahoo! news reports that there are massive riots in reaction to the 15 year old boy's death that are "crippling Greece." Recommendation 666 of the Western European Union Assembly was adopted by the European Union in December 2000 at the Nice conference. Paragraph 15 gave Javier Solana power to "convene the Council of the European Union" in "the event of an emergency." Will these Grecian riots be treated as such an emergency? If so, how soon? Stay tuned! DENNIS CUDDY WILL BE INTERVIEWED ON MY PERSPECTIVE 8 PM EASTERN TIME BY SARAH LESLIE! The doctors have told my husband that his procedures today went well -- he can even go home tonight, BUT, not until 8:30 p.m. Eastern time which runs right into my THEMICROEFFECT.COM showtime. Sarah Leslie always does a brilliant and capable job of guest hosting for me and tonight she will be interviewing Dennis Cuddy. Those are TWO SUPERSTARS so tune in, stay tuned, and God willing, I'll be back on the air next Tuesday night. Thank you for your prayers for my husband, Barry! "Spanish Foreign Minister Javier Solana's selections as North Atlantic Treaty Organization's (NATO) new Secretary-General has surprised not just a few even among his fellow citizens. He is too much the radical academic for the position associated more with the establishment type of personality. Solana, a Socialist, has had over two decades of academic and political experience. As NATO president Solana's most difficult task is the reconstruction of Bosnia. The next is NATO's expansion to Eastern Europe. "Even Spaniards were a bit taken aback when the name of Spanish Foreign Minister Javier Solana began to circulate as a possible candidate to be the next secretary-general of the North Atlantic Treaty Organization. "Although a brilliant diplomat, Solana, 53, just didn't fit the usual profile for secretaries-general, which have tended to be rock-solid establishment types from northern Europe, like Lord Carrington or retired general Manfred Worner. "The bespectacled and bearded Solana is a southerner, a Socialist, a former student radical, and a senior minister in a government which had opted to stay out of the alliance's military command. But after the resignation of Belgium's Willy Claes in October, other candidates were found wanting, and Solana surfaced as a compromise. "Solana's candidacy caused problems at home, however. Spanish Prime Minister Felipe Gonzalez, after 13 years in power, is beset with political and financial scandals. Facing general elections next March, he had indicated he might not run. And with recent opinion polls showing the ruling Socialists far behind their conservative rivals, the party was hoping that a new face such as Solana's might just boost the party in the polls. "Solana had been in the Gonzalez cabinet since the Socialists first came to power in 1982, was well-known and respected by the electorate, and equally important, was untainted by the improprieties which had brought down many of his colleagues over the past several years. "As the Socialists wrung their hands over whether to offer up one of their own for the high-profile NATO job or keep him home on the chance he might make a difference on election day, consensus in Brussels began to grow behind Solana. 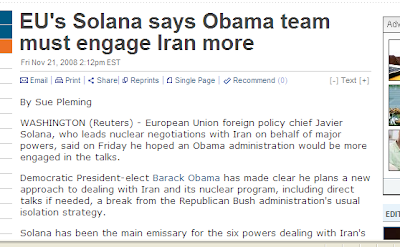 But Madrid said they would not put Solana's name up unless the Americans gave him their unqualified and public support. "Solana would be a candidate who would please many of the partners," said Italian Foreign Minister Susanna Agnelli. "But it is up to the Americans to decide who will be NATO secretary-general." Then Solana got the boost he needed. Just a week before the alliance foreign ministers were to discuss the secretary-general's post, Solana skillfully brokered a last minute deal on the wording of the final declaration of the Euro-Mediterranean conference in Barcelona. "At issue were the references to terrorism, with Israel and Syria at loggerheads. As the quarrel threatened to scuttle the two days of talks, Solana came up with new phrasing which pleased both parties and saved the day. "It was a personal success for Mr. Solana, who carried out the negotiations brilliantly," French Foreign Minister Herve de Charette told reporters. "Born in 1942 to a Madrid family with liberal and republican leanings, Solana has spent his life in the world of academia and politics, which he entered more than two decades ago by joining the underground Socialist Youth movement. Solana studied at the prestigious El Pilar school in Madrid and went on to major in physics at the Universidad Complutense. His academic career was briefly interrupted when he was expelled for membership in an anti-Franco movement, but he then carried on his studies in Britain. university where he was again kicked out for political reasons. "In the 1970s, Solana moved up the ranks of the Socialist Party, and when they won the 1982 general elections, he was appointed culture minister. He held that post until 1985 when Gonzalez named him government spokesman, and three years later he took over the education and science portfolio. "In 1992, Gonzalez tapped him for the foreign ministry job where he has helped advance Spain and Spanish interests on the international stage. "And as NATO secretary-general, Solana will need all his formidable skills to guide the alliance through its tricky task in Bosnia and the equally difficult job of expanding the organization to the east. "In remarks on taking up the post in December, Solana said "NATO's role is crucial, especially now when the security landscape of Europe is being redefined." "Benjamin Jones is EUROPE's Madrid correspondent." Curiouser and curiouser. One just can't make this stuff up! Poor Barack -- already getting orders from Solana! Javier Solana and his "Global Governance" crowd must be pretty confident of Barack Obama's future compliance. The headlines are already presumptive. Read the attached story. Click on the picture to enlarge it for viewing and reading ease. I am out of the office today. My husband is having "same day surgery" for a heart catherization and possible defibrillator replacement. Pray for us. "The task force — codenamed Operation Atalanta — will be the EU's first naval operation. It will have the same duties as the NATO mission, including escorting cargo vessels, protecting merchant ships and deterring pirate attacks. "These tasks will be done with very robust rules of engagement," Solana told reporters on the sidelines of a meeting of NATO foreign ministers." Javier Solana has long been calling for a complete consolidation of all European military facilities of all European Union member countries. Javier Solana is the head of the "chain of command" of all such operations. 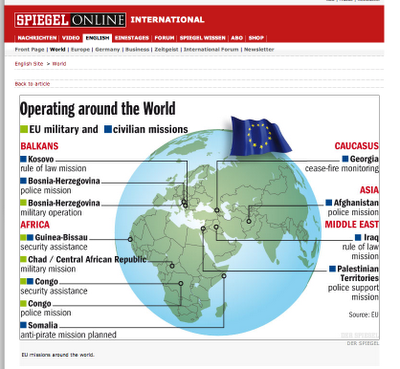 Judging from the October 28th Der Spiegel from which the above picture is taken, Javier Solana has lots of troops in the global field, so to speak. If Solana is even half-way successful in controlling or reducing the piracy problem, his prestige on the international scene is sure to vastly increase. Glad it's his day and not mine. Anybody care to hazard a guess about what all the diplomatic and military activity is about?